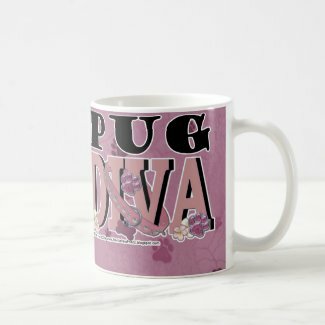 Pug design ceramic coffee mugs in a variety of styles. 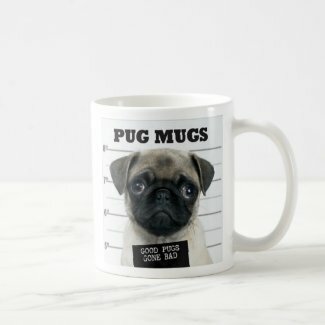 "Good Pugs Gone Bad" - This design is available on your choice of several different types and sizes of ceramic mugs. This design is available on your choice of several different types and sizes of ceramic mugs. 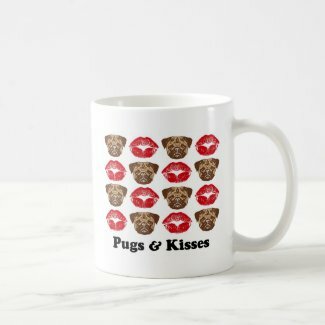 Cute pug faces and red lipstick prints. This design is available on your choice of several different types and sizes of ceramic mugs. by Mark Thaler - This design is available on your choice of several different types and sizes of ceramic mugs. Nothing beats the exceptional look and quality of our Pug Mug. Among the finest made, you will be provided with great satisfaction and long lasting enjoyment. Why not pamper yourself or give a loved one a Pug gift to show them how much you care. 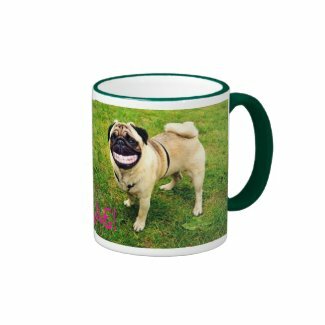 The Pug Mug will make the perfect gift for any Pug lover. Shop with confidence, because all products come with a 100% customer satisfaction guarantee. Click over now to see the big selection of Pug gifts we offer. This 16 oz. Ceramic Pug Coffee Mug is the perfect companion to your morning cup of jo. Our pug protagonist greets morning with smile and sunshine; so can you. The 16 oz. ceramic mug comes in a nicely packaged box. 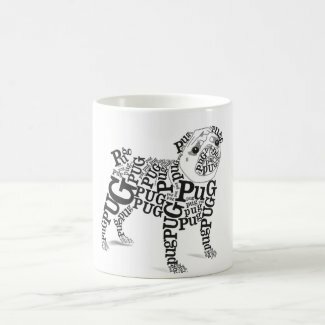 If you love dogs and especially Pugs, you will love the Pug Mug! 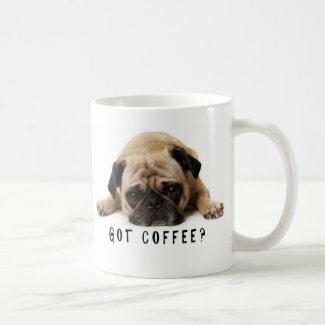 This cute mug looks just like a Pug and holds your favorite hot beverage. Just one look into this little guy's eyes and you will fall in love. 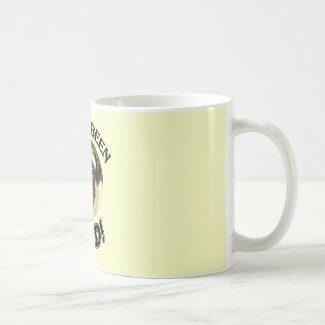 This Pug Mug makes a great gift for any dog lover. Starry Night by Vincent Van Gogh, adapted to include 2 Pugs. Retro Hippie Pug design by Amy Cappelli. Here's Biker Buster to add a cheery accent to your coffee or tea break. Sure to bring a smile. 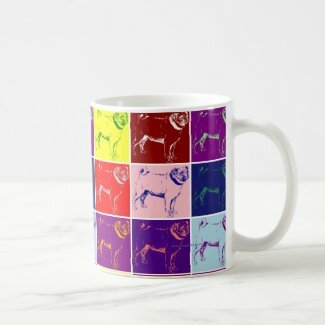 Warhol-effect pugs printed all the way across the mug. Tattoo-style graphic. A large easy-grip handle will make this your go-to coffee cup, and it's dishwasher and microwave-safe. Hilarious drawing of a bunch of pugs in a volkswagen hippie bus. This design is available on your choice of several different types and sizes of ceramic mugs. Show the World that YOU are a PROUD Pug Dog Owner! This DIVA design is embellished with a dog collar and Pink Paw Prints. A pug comprised of many different variations of the word itself! A fun gift for an avid animal lover and a well crafted witty typographic design. This design is available on your choice of several different types and sizes of ceramic mugs. 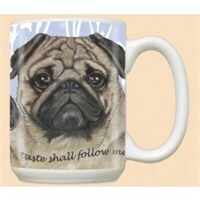 MANY MORE like this at Pug Design Mugs at Zazzle.